Lets talk camping and food for a sec. I love camping. I love fresh air and open roads. I love sleeping in the dead quiet of the wilderness and waking up with crazy camping-hair. And I love love loooove cooking outdoors. On a recent trip up the California coast, we made a quick stop in a strip mall somewhere outside of Redding. We were drifting through the mega-mart, floating through the produce isle aimlessly when we spotted the most perfect salmon in the history of the world. As if a beam of light from the heavens shone down and guided us towards the seafood display, we were drawn in. Firm and pink with delicate white ribbons running through it; sushi-grade in its freshness. Everything around this rosy steak looked dull and gray in contrast. The salmon would be mine. I quickly flashed back to the sign in the parking lot. What else was in this strip mall? “LOWES Hardware! 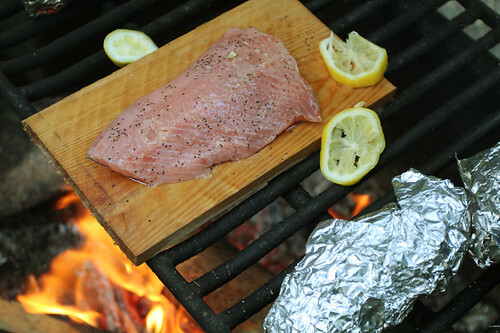 !” Tonight’s dinner would be cedar plank salmon. After acquiring the fish and a few lemons, we ran next door to Lowes and made a beeline for lumber. Untreated cedar fencing planks in 6 foot pieces were $1.29 each. We purchased our plank, and headed to camp. 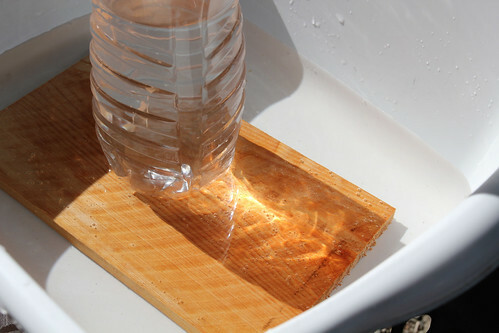 With our camping saw, we cut the wood into smaller pieces, and began soaking it in water while we got the fire blazing. 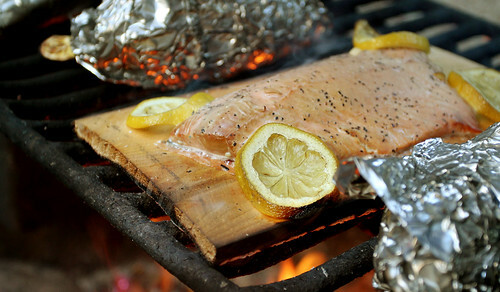 After a light salt and pepper and squeeze of lemon, the salmon went on the plank, and the plank over the fire. While shopping, we had picked up a yam and sweet potato to cook in the fire. Those were washed, poked with forks, double wrapped in foil, and they went into the fire as well. We finished up the meal with veggies and hummus and ate our dinner under a canopy of pine tree branches. Yum yum lovely lovely. Oh and p.s. 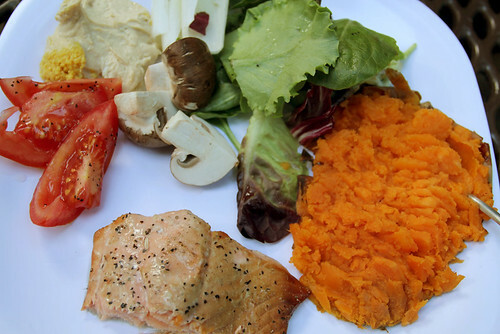 we liked the salmon so much, we plan on making this a regular addition to our at-home menu. Enjoy! So happy to see you pop up in my google reader. This is gourmet camp food for sure. Great pics. ohhh that looks so good! 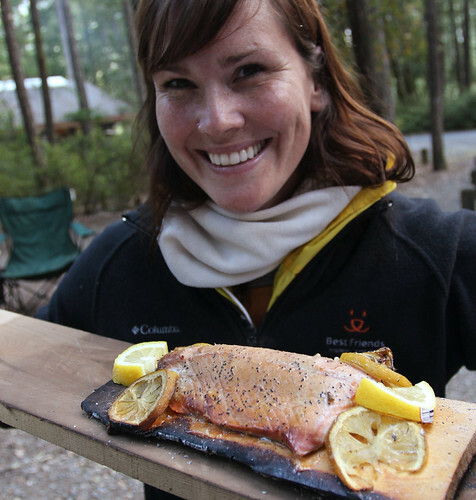 i love fresh salmon. i want to come camping with youll! Thanks Rox! I kept thinking about you telling me to get this blog going again Love you! Meliss, are you a camper?? i can be…. i havent since i was little though but we have tons of camping stuff.